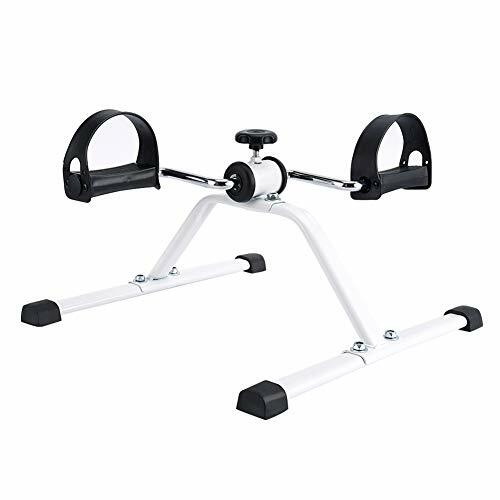 SYNTEAM Pedal Exerciser is mini, compact, portable, easy to exercise and store, provide low impact exercise for muscles toning and strengthening, suit for children, adults, older and people with physical therapy. ☺ARMS AND LEGS EXERCISE: This folding exercise bike can be used as an arm pedal exerciser or leg exercises bike under desk, easily adjustable tension for various resistances with tension screw. ☺FOR TIMELESS PEOPLE: This exercise bike is suitable for people who do not have enough time to exercise,use trivial time let the blue collar and white collar get exercise when they are working in the office or watching TV at home. ☺STAY HEALTHY AND IN GOOD CONDITION: Daily exercise not only keeps the body, but also improves blood circulation and release stress, makes people stay in good condition. ☺PEDAL EXERCISER FOR SENIORS AND PEOPLE WITH PHYSICAL THERAPY: Provide low impact exercise for muscles toning and strengthening, exercising arms and legs, training joint flexibility, improving stamina and relieving tension, perfect for physical therapy and rehabilitation. ☺CONTACT US PLEASE: If you need our help after you receive the product, contact us please, we are happy to serve you. ☺NOTICE: Heat is a normal phenomenon during use, do not touch after prolonged use. ADJUSTABLE TENSION AND TONING MUSCLES: Ultra compact design makes training easier, is good for toning muscles both arms and legs, increasing blood circulation, exercising joint flexibility, improving stamina and relieving tension. ULTRA QUIET AND LIGHTWEIGHT: There are no noise when you are workout, you can enjoy to read books or listen to music, for you to get relax. And this pedal exerciser is really lightweight, easy to move. WORKOUT ANYWHERE:Sturdy frame and non-slip feet provide traction, stable and no shaking, guarantee security, lifetime durability. NOTICE: Requires simple assembly to use, with tools in the box. Heat is a normal phenomenon during use, do not touch after prolonged use. WHAT YOU GET: A SYNTEAM compact pedal exerciser, a manual, tools. If you have any questions about this product by Synteam, contact us by completing and submitting the form below. If you are looking for a specif part number, please include it with your message.